Black Mesa Black-on-white olla. Click the image above to open the Black Mesa Black-on-white gallery. 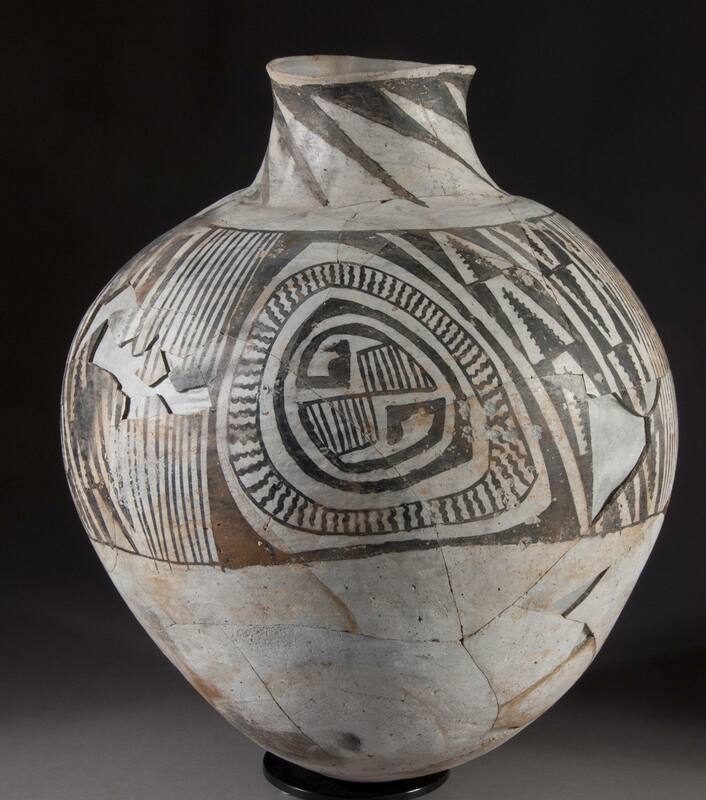 Black Mesa Black-on-white is type of Tusayan White Ware that is found regularly across the greater part of northeastern Arizona. The olla pictured above is interactive! Date Range: Kayenta Heartland: A.D. 900-1160 (Christenson 1994), Flagstaff Region: A.D. 1025-1140 (per Christian Downum, Northern Arizona University). Temper: Fairly abundant quartz sand; sometimes conspicuous on undecorated surfaces. Surface Finish: Interior surface bowls and exterior surface jars are polished and somewhat bumpy. Surface Color: White, sometimes with a bluish tint. Forms: Bowls, dippers (rare), jars, and jugs. Bowls: 3 to 6 mm; jars: 3 to 7.3 mm. Paint: Dull black, usually fairly dense, occasionally slightly watery, with slight brownish tint. Design: Bowl interiors and jar exteriors only; bowl bottoms undecorated; jar bottoms undecorated; rims unpainted; stripes and wide straight horizontal lines, rarely curved lines, large solid triangles, isosceles and elongated; triangles sometimes in opposed series forming rows of open diamonds; stepped elements rare, solid squares rare, solid areas with large pendent dots; interlocking scrolls. Average width of lines about 7.1 mm. Comparisons: Sosi Black-on white treatment is bolder and execution more precise; elements more closely massed; pendant dots absent; triangles either isolated or contiguous, infrequent. Puerco Black-on-white and Red Mesa Black-on-white have mineral paint. Other Names: Black-on-white ware; 2nd ware ; Black Mesa Pueblo II; Deadmans Black-on-white. Christenson, Andrew. (1994) A Test of Mean Ceramic Dating Using Well-Dated Kayenta-Anasazi Sites. Kiva 59(3):297-317.